One of the obstacles I had to overcome as a new Party Plan Consultant was… how do I CARRY all of this STUFF!?! Because I purchased one of the larger demo kits that my company offered, I literally had 80 or so products I had to tote around from party to party. Being the Diva that I am, suit cases just wasnt going to cut it, so I headed to the internet to see what I could find. That is when my love affair with Yazmo began. 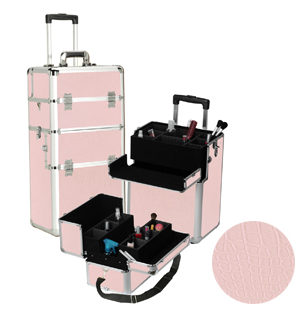 Yazmo offers an incredible selection of cases – from small makeup cases to the larger Train Cases and Rolling Cases (which is what I used for years – in pink of course!) all at remarkable prices. I mean – how CUTE is this!?! My favorite part about the Yazmo cases are that there are so many different compartments, I kept my kit organized at all times. I knew where everything went, so if there was an empty “spot” – I knew exactly what was missing. My guests also loved how easily everything fit, and how professional my presentation was… I literally rolled my little pink case in, and when I was finished, packed it all up and rolled right out. No more taking trip after trip after trip to the car! Yazmo also offers free ground shipping on all orders in the Continental US – and they are FAST! I received my kit the VERY next day after I ordered! If you are looking for a great way to carry your demo, and are sick of walking to the car over and over or dealing with spills in suit cases and Ziploc bags, check out Yazmo to see which case is right for you!